I’m always excited when I receive a new version of Vectorworks...I’m even more excited when I then get to write about what I’ve learned and share those secrets with others. Nemetschek Vectorworks, Inc. is pleased to announce the publication of a new training guide for users of Vectorworks® software: Entertainment Design: Scenery, Lighting, and Sound with Vectorworks Spotlight, Third Edition. This book, written by award-winning scenic and lighting designer Kevin Lee Allen, explores the use of the Vectorworks Spotlight with Renderworks program for the entertainment industries. 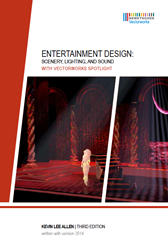 While the methods and techniques described are applicable to film, television, concerts, exhibits and themed architecture or interiors, this tutorial focuses on a project that creates lighting, sound and set designs for the stage, the root of entertainment design. From one step beyond traditional pencil thumbnails, this guide outlines a process of design development and collaboration with other designers and technical staff. The text is tutorial-based and directs the user to create two projects, each supported by a series of simple exercises: from the creation of a simple 3D object, to the creation of scenic, sound, and lighting designs for a theoretical Broadway-scale production of Romeo & Juliet. This book is written for professional designers, as well as designers in education (students, instructors, schools). It is intended for use with the 2014 version of Vectorworks Spotlight with Renderworks or Designer with Renderworks. It is a part of Nemetschek Vectorworks’ self-paced training options, designed for people who like to learn at their own pace. For more information and to purchase these tutorials, please visit http://www.vectorworks.net/training/guides.php. Nemetschek Vectorworks, Inc. is the developer of Vectorworks software, a line of industry-specific CAD and BIM solutions that allow designers to easily capture, develop and communicate their ideas with accuracy and efficiency. With more than 450,000 users around the world, Vectorworks software is a global leader in 3D design technologies for the AEC, landscape and entertainment industries. Nemetschek Vectorworks was founded in 1985 and has been a part of The Nemetschek Group since its acquisition in 2000. For more information, visit http://www.vectorworks.net. Kevin Lee Allen is a multiple-award-winning scenic and lighting designer who works in theater, film, television, museums and corporate environments, including architainment, exhibits, fashion and special events. Notable projects include work for Fox News, the United States Government, CNN and CNN International, a virtual interview with Benjamin Franklin, productions of Romeo and Juliet, The Tempest and the Chase Bank Flagship Signage in Times Square. His design sketches are held in private collections and in the permanent collection of the Library of Congress. Allen has been a Vectorworks software user since MiniCAD version 3. He has taught Vectorworks courses at the university level and has given lectures and demonstrations at the Kennedy Center American College Theatre Festival (Region 2 Festivals). For more information, visit http://klad.com.